SAN FRANCISCO—Regeneron Pharmaceticals said the $50 million-plus consortium it has launched with five biopharmas will reshape drug development and even human health beyond simply speeding up exome sequencing of all 500,000 people within the UK Biobank by three years. 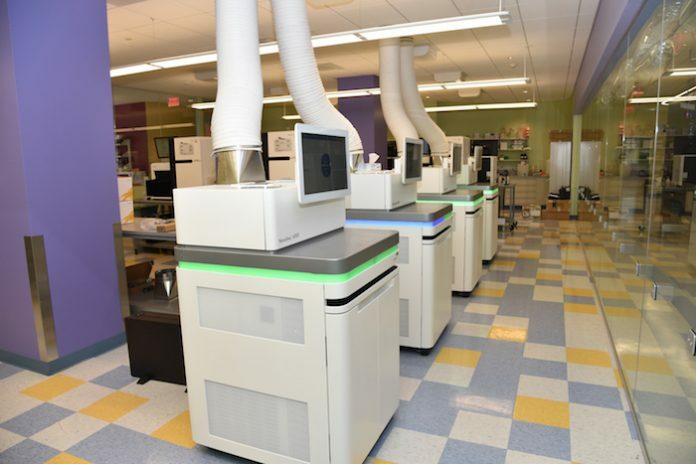 AbbVie, Alnylam Pharmaceuticals, AstraZeneca, Biogen and Pfizer have agreed to invest $10 million each to join the Regeneron-led precompetitive sequencing project. The five may be joined by additional biopharma partners that have expressed interest, Regeneron said, expanding the ultimate value of the consortium. The consortium will carry out the ambitious project announced last year by the UK Biobank to generate sequencing data from its 500,000 volunteer participants. Data will be coupled with the participants' detailed and de-identified medical and health records–including measures of brain and heart activity and body imaging–creating a resource designed to link human genetic variations to human biology and disease. The UK Biobank originally targeted 2022 as the completion date for the project. “This is a true treasure trove of big data,” George D. Yancopoulos, M.D., Ph.D., Regeneron's president and CSO, said at the J.P. Morgan 36th Annual Healthcare Conference, held here at the Westin St. Francis Hotel. Minutes later, addressing analysts at a “breakout” session following the presentation, Yancopoulos said the Biobank sequencing consortium will follow Regeneron's model of coupling sequencing and health/medical data as practiced in the biotech's more than three-year-old collaboration with Geisinger Health System. Geisinger serves more than 3 million patients, most of them in Pennsylvania. Since 2014, Regeneron and Geisinger have teamed up through their DiscovEHR partnership to combine genotypic and phenotypic data by creating databases of paired exome sequences and de-identified electronic health records of the health system's patients. The partners aim to discover associations between genes and diseases that are intended to lead to new treatments for Regeneron, and better outcomes for Geisinger patients. Data has been collected on nearly 100,000 people so far, according to Geisinger. Yancopoulos shared one example: A Geisinger patient who passed out during the summer while playing softball was sequenced and found to need more than simple rehydration—she had a rare genetic mutation that predisposed her to a potentially fatal cardiac arrhythmia. As a result, she was treated via defibrillator, and her family members were sequenced, several of whom had the same mutation. “There are only less than 100 actionable genes on which we can take these actions for patients. We're going to discover many more actionable genes. We're going to develop new approaches and new treatments to deal with these actionable genes, and the healthcare system is going to be able to take advantage of them,” Yancopoulos said. Unlike the Regeneron-Geisinger collaboration, the Biobank consortium plans to make its data broadly accessible to researchers through UK Biobank by 2020. That availability will occur, however, after an approximately year-long period in which consortium members will have exclusive access to the sequencing data–Though members have committed to make public all “significant” research findings. Sequencing of UK Biobank samples will continue to be performed by the biotech giant's Regeneron Genetics Center (RGC) subsidiary. In November, the RGC surpassed 250,000 exomes sequenced since its creation in 2014, and discussed plans to ramp up its sequencing rate from 200,000 exomes per year to between 400,000 and 500,000 people a year. The Biobank exome sequencing project builds on previously completed genotyping carried out on the global health resource's 500,000 samples, and made public last year. UK Biobank's samples come from 500,000 adults between ages 40-69 who were recruited between 2006 AND 2010. UK Biobank is a nonprofit charity established by the Wellcome Trust, the UK Medical Research Council, the UK Department of Health, the government of Scotland, and the Northwest Regional Development Agency. Regeneron first announced the UK Biobank sequencing project in March 2017 as a three- to five-year effort that would also involve GlaxoSmithKline (GSK). Regeneron and GSK agreed to invest undisclosed amounts toward sequencing the first 50,000 exomes from the UK Biobank, an initiative that has since been completed. Sir Rory Collins, UK Biobank principal investigator, told Forbes that the Biobank will launch a new project with GSK to sequence whole genomes in the future.